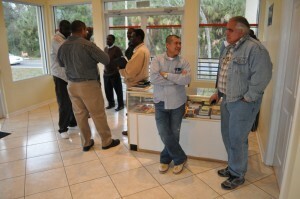 Ethnic pastors get acquainted before meeting more formally to determine ways to forge a common identity and to work together to plant churches. The four-day session is led by Jay Bell, of Internationals USA, and Jesus Munoz, of Grace Brethren International Missions (GBIM). Other speakers include Dave Guiles, GBIM executive director and Tom Avey, fellowship coordinator for the Fellowship of Grace Brethren Churches. Among those attending are representative of Native American (Navajo and Lipan Apache), African American, Haitian, and Hispanic Grace Brethren congregations. The consultation is made possible in part by a generous grant from the Grace Brethren Investment Foundation.